Linguists predict that over half of the almost 7,000 languages spoken in the world today will disappear by the end of the century. 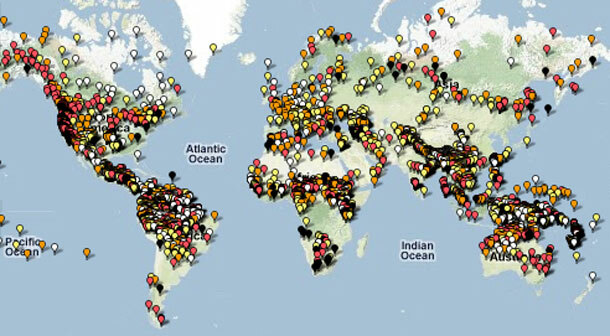 According to Ethnologue, 473 languages currently are close to extinction. In the Americas alone, 182 are endangered. The Rosetta Project created this map to highlight the near-extinct languages in Africa and the Americas. They are working to update the map to include the entire world. Berbice Dutch is a mixture of the Zeeland dialect of Dutch, the local Arawak Indian language, and Ijo, which was spoken by slaves from Nigeria… The last speakers of this language were found in the 1970s by Ian Robertson, living on the upper reaches of the Berbice River in and around the area of the Wiruni Creek. The last known Berbice Dutch Creole speaker was Bertha Bell, who was 103 years old when last interviewed by Ian Robertson and a UWI linguistics research team in March, 2004. She died in 2005. Listen to a BBC report on Boa Sr, the last speaker of the Bo language, which was spoken by the Bo tribe of the Andaman islands for up to 65,000 years. Again That narrow mind of # 5 secertary Of how’s We are liveing in a universal world Narrow minds how do not respet others ! Do we really have to care on what language turns to dust. It is not just that people speak English it is that to translate those other languages into English becomes a problem when many of these languages do not have a word for the modern world. Example; How do you say, “computer” in these dying languages. Many of these languages are just a narrow band or within a spot in a country. It is like trying to understand English that is spoken in NYC and that similar English spoken in the SouthWest. It is the same, yet. The DUTCH are the worst when coming to protect their language. Dutch dialects and creols are dying out so fast over the world and when you go Amsterdam you will find the Dutch try to speak English rather than Dutch even if you speak Dutch well but you don’t sound like a native Dutch person they will speak English to you. Well, both Greek and Latin were lingua franca of scholars and merchants for centuries. French had a wide reach at one time. English is today the most common language of international communication and probably will remain so for a long time to come. But one can never say forever. At any rate, the spread of automated computer translation might ease the burden on many forced to learn English, which is the not easiest language for many to master. We created a map last year of the First Nations languages of British Columbia (B.C. ), Canada. The language map, a culmination of five years of research, design and collaboration navigates like Google Maps, and divides B.C. into regions based on the First Nations language spoken there. The map is not only a great representation of First Nations language regions in B.C., but also a great tool for understanding the status of the 32 First Nations languages and 59 dialects spoken in the province. You know, humanity is going to have a single universal language and that is English, however, we need to be careful not to distroy local language and culture. This will have a detrimental effect on individuals of the local cultures. The variance in human culture adds a beautiful mix like a bunch of different flowers – we must always be one the lookout to minimize the negative effects on local culture by humanity acting on the idea of the oneness of humanity. The localization of economy and the globalization of humanity is the best route to succeed at the goal: the “good and well-being of all”.